BNI's Standard Estimating Practice 10th Edition is a valuable reference manual for estimating construction projects! 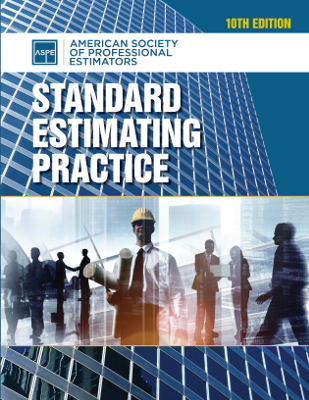 The new 10th edition of Standard Estimating Practice, presented by The American Society of Professional Estimators, is an invaluable “how to” reference manual on the practice of estimating construction projects. Information covers all aspects of estimating and specific examples of a wide variety of specialty estimates are included for reference, arranged in the CSI format. Standard Estimating Practice presents a standard set of practices and procedures proven to create consistent estimates. From the order of magnitude to conceptual design, design development, construction documents, to the bid and the various types of contracts you’ll run up against. Every step is covered in detail, from specs and plan review to what to expect on bidding day. With the help of this manual, you’ll be able to develop estimates that are consistent, accurate, and complete. Section 17 – Estimating Change Orders: Cost or Opportunity? The 10th edition of ASPE’s standard estimating practice manual will make a great addition to your estimating library as a ready reference.